Every year Allan Gray, one of South Africa’s leading investment companies, recruit the brightest graduates from universities around the country. Graduates more interested in achieving their long-term goals than the many trappings of campus life. Those with focus. But there’s one problem… distractions. As a student, they’re in no short supply. There are the usual suspects: parties, guys, girls, and of course more parties. But it doesn’t stop there, online there are more still: Cute Animals, Grumpy Animals, Dramatic Animals, Thug Life Animals, Babies, Selfies, Epic Fails, Best-ofs etc. You name it, they’re waiting to distract you for hours on end. What we needed was to separate focused students from those more prone to distraction. But how? By pitting them against the very things that prevent them from excelling. We launched an all-out assault on campuses countrywide – an integrated campaign showcasing distractions in all forms: on posters, on campus radio stations, in emailers, on targeted microsites and even in a public library. Nowhere and no one was safe. 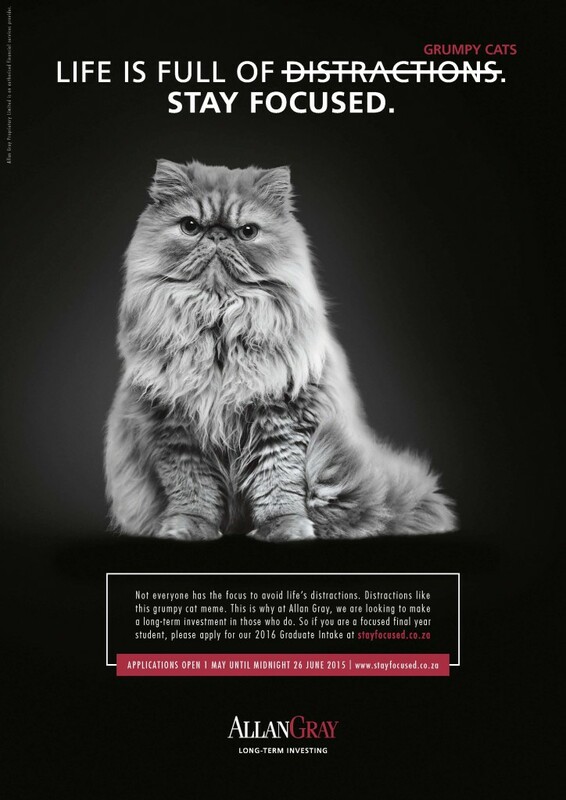 Posters on campus featured the likes of Grumpy Cat. In addition to campaign specific radio ads, campus radio station DJs heard radio spots that talked to their very own distractions in the middle of their shows live on air. University Social Coordinators received emailers directing them to bespoke microsites that exposed their biggest distractions. We carried out filmed social experiments on unsuspecting study groups in a library. All of our messaging led students to stayfocused.co.za where they found out about the Allan Gray 2016 Graduate Intake and could apply to join the firm. 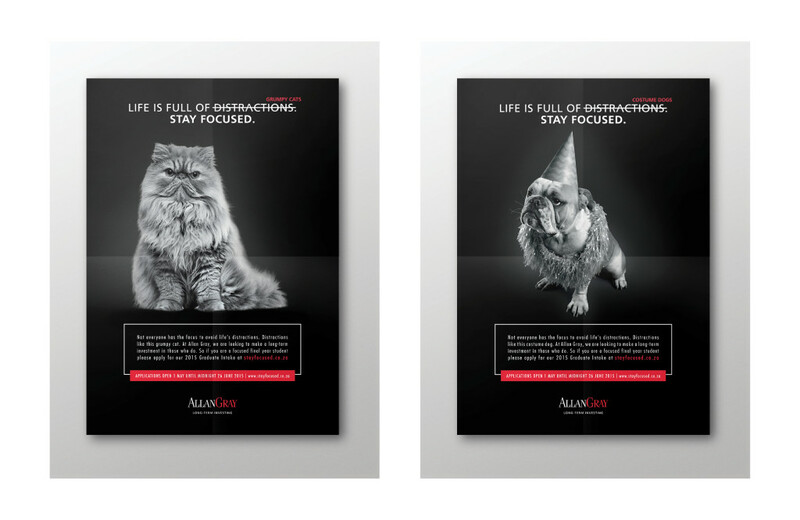 Amidst all these distractions, in the first month alone, we’ve had a 161.6% increase in applications than during the same period of last year’s campaign – applications from those willing to put their focus to the ultimate test: an opportunity to work at Allan Gray. Following the successful Haunted Road radio campaign, we launched a Haunted Road cinema and TV ad that flighted during the December holidays. The spot promotes the benefits of fitting Volkswagen Genuine Parts, and not breaking down on these scary roads. We teamed up with National Sea Rescue Institute (NSRI) to encourage paddlers to improve their safety measures when paddling. Ogilvy Cape Town was asked by the NSRI to create a campaign to encourage the paddling community to #BeBrighter and #WearBrightColours which would help Sea Rescue to take the search out of Search and Rescue. A special thanks to Primedia who gave almost R 80 000.00 worth of free airtime on KFM and Cape Talk to promote the message. GoPro: Find the GoPro. Win the GoPro. GoPro is the world’s most versatile camera. It can go anywhere: on humans, on strange flying animals, on down-hill board things, on neon hula-hoops and even on hipsters. We needed a way of showing off all its incredible features on, wait for it, radio. Find the GoPro. Win the GoPro. A real-time GoPro treasure hunt on radio and online that gave South Africans the opportunity to win a GoPro. 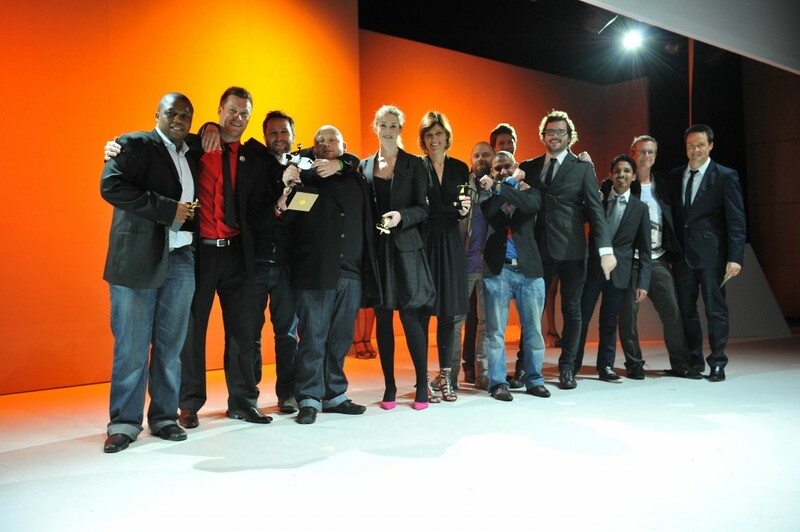 To say we are thrilled with our performance at last weekends 2012 Loeries is an understatement. The agency together with our clients received 31 awards, including a Grand Prix in Integrated for the Be the Coach campaign for Carling Black Label, adding to a series of global accolades which has made it the most awarded integrated campaign anywhere in the world over the past 12 months. 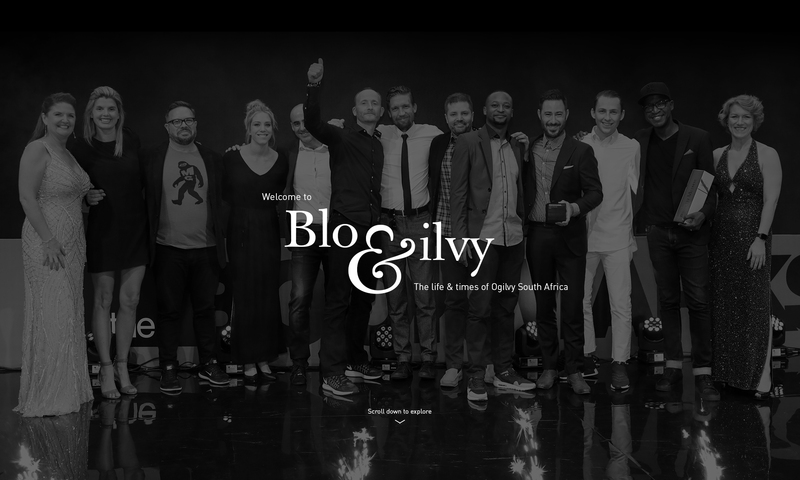 Below are two quotes from our MD, Gavin Levinsohn, and our ECD, Chris Gotz, as well as a list of all the awards won, including links to the work.